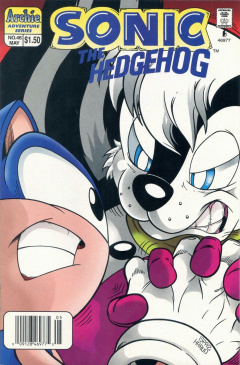 Sonic the Hedgehog 46 is the forty-sixth issue of the Sonic the Hedgehog comic. This comic features one story: "Countdown to Armageddon". It also features part 4 of "Knuckles' Quest". Uncle Chuck recalls back to his past, before Robotnik's tyranny, when he was a renown scientist in Mobotropolis. He directed his efforts toward developing a way to prolong the life of the citizens of Mobius, creating the roboticizer. He tried his invention on an ailing hedgehog, only to helplessly watch his invention turn the hedgehog fully robotic. In the present day, in one of the Knothole Village huts, Uncle Chuck shows a video image of this hedgehog to the Freedom Fighters, showing off his new digital video recorders placed in his optic sensors. He then opens up his stomach panel to show off some CDs that allow him to play back any video he records. Dulcy bumps in, asking if he has an antenna to pick up any movie stations, making Sally retort back at her for such a comment. He continues his story about the video recording, stating that the video he showed was a recording from the secret surveillance system in the remaining royal palace. Through watching these videos, he was able to determine that Robotnik sabotaged his roboticizer, allowing the former warlord to use it for his own needs. He, thus, believes that they won't be able to deroboticize everybody. Angry at himself for not being able to do anything, Uncle Chuck is comforted by Rotor and Sally, who has an idea. Sally gathers the troops around a campfire at twilight, ready to bolster their resolve. There, Uncle Chuck reveals more about his history before the downfall of the Kingdom. After suffering from massive guilt in creating the roboticizer, he resigned his position as Scientific Advisor to the King and started up his chili dog restaurant instead. He further goes on to state that the discovery of Sleuth Dawg as a traitor has shown further evidence that he is not cut up for what he should be doing. He also mentions his lack of informing the Freedom Fighters soon enough about the threat of the Death Egg. Despite all these circumstances, Sally reaffirms his faith by stating that he just didn't go deep enough into the truth. Sonic, eating some chili dogs, also tells him that he is still the best in the chili dog business. Suddenly, a group of eyes appear from the nearby bushes and the sound of numerous wolves is heard. Dulcy steps in and breathes some fire into the bush area to cast a light on their infiltrators: the Wolf Pack Freedom Fighters. Sally and Sonic order her to ease up as the band of wolves, led by Lupe, walk out of the bushes and introduce themselves to the group. After the formalities, everybody returns to the camp fire to discuss strategy. While sitting around the fire, Drago tells the Freedom Fighters that Robotnik is working on a new batch of super bots that could be stronger than even the Combots. Tails notices that Drago is reluctant to eat his chili dog, so he points it out. Drago replies that, after leaving their previous mission in Robotropolis, they are now eating with a robot. Uncle Chuck doesn't reply, but Sonic does, angry that Drago would call him out as working with Robotnik. Drago is not convinced, thinking that he could still be a spy under Robotnik, though Sonic is certain that he isn't. A new person enters in to the conversation, claiming that, if Sonic 'the amateur' says something, people do listen. From near a tree, Geoffrey St. John arrives, telling the group to cut down on the camp fire to prevent gathering attention. He walks over to Sally and gives her a big kiss, quietly angering Sonic. He then joins the Uncle Chuck bandwagon, mentioning that he has been doing his own spying on the robotic hedgehog. Uncle Chuck tries to protest, but Geoffrey tells the group that the tape that Uncle Chuck showed earlier was found by Sleuth Dawg earlier on. Uncle Chuck confides with the group that the tape was captured weeks before Sleuth was determined to be a traitor, and hence, the tape is still authentic. Picking his teeth with a toothpick, Geoffrey shrugs it off, noting that it is only one spy protecting another. The Freedom Fighters still don't believe Geoffrey, so he gets even more angry in trying to explain that Uncle Chuck is not on their side. Sonic yells back, calling him out as stupid, while Geoffrey, in anger, tells Sonic that this is his war, and not a game. This takes Sonic over the edge, so he gives Geoffrey a huge punch to the face, knocking him back. He recovers from the punch, setting up his wrist bow and fires a string at Sonic, which tries him up to a nearby tree. Now helpless on the tree, Geoffrey walks over and prepares to fire one last shot at Sonic. Before he can fire, Antoine intervenes, punching Geoffrey aside in a rare sight of bravery. The punch leaves Geoffrey dazed for a minute, and wondering why Antoine is getting involved in something that doesn't include him. Antoine claims that he has a problem with him, stating that Uncle Chuck is not the traitor, but that it is actually Geoffrey. He recalls Mobotropolis before the fall, where the top general and close friend of the King convinced him to develop a rebel underground. At the same time, Antoine was a cadet-in-training for the military, for the day when the Kingdom may be attacked by enemies. The day of the fall of the Kingdom came before the development of the rebel underground, and the general became a causality of war, becoming roboticized. For this fact alone, Antoine calls out Geoffrey as a traitor for claiming to be the leader of the King's rebel underground. Antoine then jumps at Geoffrey and fights him again, stating that that General was his father and that Antoine is an imposter. They have a short fight that is interrupted by Sally, prompting Antoine to step aside from the group. Tails is shocked that Antoine was never a real soldier in the King's military, only a cadet, while Sonic tells him that Antoine still wears the uniform in respect to his father. Bunnie Rabbot steps into the conversation, also noting that Antoine, despite being cowardly at present at times, has rose up to his job as a Freedom Fighter and developed a lot of courage. She even recalls one day, prior to being roboticized, Antoine saving her life from a SWATbot. Being loyal, he obeyed the royal nature of their society, which eventually led to an infatuation for Sally. Unfortunately, when he found that Sally preferred Sonic, and with the loss of his father, his courageousness diminished. She decides to go talk to Antoine to sort everything out. Antoine, sitting away from the group, is approached by Bunnie, who tries to comfort him by telling him that she still believes that he is a brave person, despite what has happened in the past. She then tells him that she really cares about him, giving him a kiss on the cheek. Even with love in the air, the night is filled with suspicion as Lupe, sitting at the camp fire, is approached by Drago, who had disappeared for a bit to go for a 'walk'. Lupe and the other surround Drago, noting that that was the third time he has left the pack in a week without official notice. Thus, she claims she will keep an eye on him, while Geoffrey states he'll continue to keep an eye on Uncle Chuck. Antoine and Sonic confront Geoffrey, forcing Sally to intervene again, separating everybody. She tells everybody that there is no substantiated evidence, and that time will tell if there are actually traitors in their midst. She then looks to the sky, hoping that Knuckles will finish his quest to save the King, and also their world. Continued in Sonic Vs. Knuckles - Battle Royal and issue 47. Knuckles continues his quest to find the King's sword and crown. Having previously found the Paladin, he now searches through the numerous catacombs in the Floating Island to find the next part of his quest. He rounds a corner in one of the caverns, tripping over the foot of a skeleton on the floor, sending him falling down a deep crevasse in the cave. He spreads out his quills just in time to soften his landing, while the skeleton suffers a less fortunate fate. Now in a new cavern, he walks along and explores, noticing runes on the walls. He eventually crawls down a wall with his knuckles, smelling a quite pungent and horrific scent. He continues along and arrives at the end of one of the levels in the cavern. He looks down and sees two beings, one sitting in a chair at a table, and the other standing in front of a boiling cauldron chanting a spell. He climbs down to get a closer look, noticing that the two beings are the Wizard and Alchemist that the Ancient Walkers mentioned. He also surmises that they are Mathias Poe and Damocles the Elder, according to the Paladin. He prepares to attack the two, but is cut short when he loses grip on the wall, landing beside Mathias Poe. The alchemist takes notice quickly, summoning a spell from his cauldron that sends a ray of light from the cauldron to the wizard, and then to a nearby rock. The rock transforms into a metallic golem that quickly attacks Knuckles. He dodges the punch, then goes for a punch of his own. Unfortunately, Knuckles' strength isn't enough, as his best attack doesn't phase the golem. He attacks again, but the punch does nothing. Avoiding another punch from the golem, a voice from Knuckles' backpack tells him that golems can only be animated if they receive a constant source of magic. Knuckles is curious who told him that, as he hears a laugh. Archimedes appears before Mathias Poe, having been hiding in the backpack, hitting him with a strong burst of fire. With the alchemist down, the golem stops attacking, giving Knuckles the opportunity to attack. He is able to easily destroy the golem, while Archimedes is glad that he hitched a ride with him. Aside, Knuckles notices that the wizard sitting at the table isn't moving, making them realize that it is actually a dummy. Knuckles ties up Poe, recalling the Ancient Walkers mentioning that the alchemist stands alone, and hence why the wizard is a dummy. The questions now are, who is the real Damocles the Elder, and where to go to find the sword? Knuckles looks over and notices a series of acidic containers knocked over on the table that start to eat away at the dummy. He grabs Archimedes off the dummy, while the dummy dissolves to reveal...the King's sword. With his mission a success, he holds up the sword and calls out to it to lead him the Hall of Limbo, and the Crown of Acorns. Nothing happens, causing Archimedes to believe that it may only work on royalty. Nonetheless, his quest is now complete. With the sword in hand, he now prepares to return to Sally to hand it over. Jules Hedgehog, Sonic the Hedgehog's father and Uncle Chuck's brother, in his roboticized form, but not introduced. The Wolf Pack Freedom Fighters, including Lupe and Drago. Armand D'Coolette, only mentioned in a flashback and by the name 'General'. The name Armand isn't mentioned in the comic until issue 207. This issue features many aspects that will lead up to the Endgame saga; specifically, that of a traitor in the midst of the Freedom Fighters and increased hostilities between various members of the group. This is the first issue to be pencilled by Nelson Ortega. For the first time, Bunnie Rabbot is shown in a flashback prior to her roboticization. This is the second instance of a relationship developing between Antoine and Bunnie, the first shown in issue 23. One of the runes on the cavern walls that Knuckles finds is the Sega Saturn logo. Archimedes telling Knuckles to 'terminate' the golem, and Knuckles destroying it with the slogan 'hasta la vista' references The Terminator.